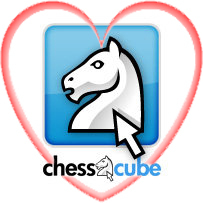 If you ChessCube we have a great month planned for you this July! 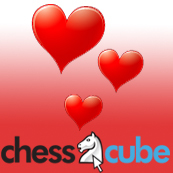 ChessCube specials, competitions, and lots of other Cubit and VIP prizes! - Get DOUBLE CUBITS in the 2 for 1 special! - Get the "Fantasy" background in the online ChessCube Store for just 10 Cubits - this week only - normal price is 2500 Cubits! - 1 month VIP reduced to $3.97 - That's a $2.01 saving! - 1 Year VIP reduced to $26.97 - That's a $7.02 saving! - 6 month VIP reduced from $22.99 to just $11.99! - All ChessCube Cinema Video Bundles Prices reduced by 50% ! - Double XP (2x) for all standard members, 5x XP for all VIP members - all week! - NO CHARGES ON CUBIT GAMES! Make sure that you're hanging around in the Cube Cafe each day of July as we'll be picking one name per day to win 500 Cubits!! 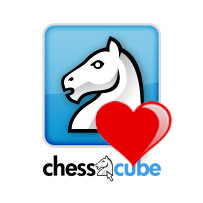 Each 500 Cubit winner per day will go into a lucky draw to win a 1 year ChessCube VIP account! Day 31 winner - you? Remember to check out our online merchandise store. 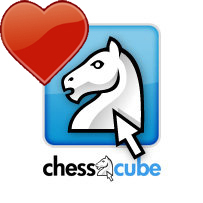 Get your ChessCube or chess merchandise now and show your love for the Cube. You'll be the envy of your peers at real-world tournaments! We are giving away over 11 million Cubits in ChessCube Tournaments in July, including tons of Crowns, Cubits and VIP for all our users! 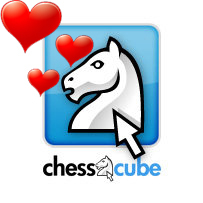 July is Love month at ChessCube - we've created these awesome deals and events for you - our users. 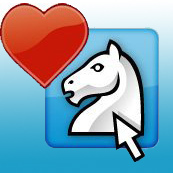 Please consider supporting ChessCube in any way you can - it helps us go further on the road to bringing you the best chess site online! 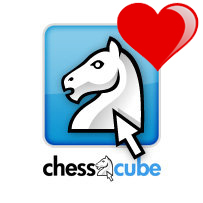 Felicidades ChessCube: I love ChessCube.